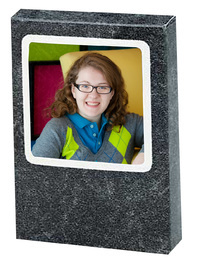 The TAP Marble Panel Mount is a great option for sports packaging, senior photos, proms, and many other events. The neutral gray marble pattern will enhance any photo. The dual easel on the back allows you to display vertical or horizontal prints. You can also add coordinating Marble Folders and Marble Memory Mates. Don't forget to add foil imprinting with your studio die and the name and date of your event. Dual ease on the back to accommodate a vertical or horizontal print. Customers who purchased a TAP Marble Panel Mount also purchased these items.